If you are not already familiar with it, Kaggle is a data science competition platform and community. Companies and researchers provide their datasets in hopes that the competing contestants will produce robust and accurate models that can be integrated into their business or research operations. In this post, we’ll walk through the steps for competing in Kaggle’s “Digit Recognizer” contest using SQL-based machine learning tools to identify hand-written digits. The Digit Recognizer contest makes use of the well-known MNIST database of handwritten digits, taken from American Census Bureau employees. The machine learning community discovered that the handwritten digit dataset is a great fit for analysis, and they are finding ways to improve digit recognizers by using it as a training set. Use cases for improved digit recognizers include — perhaps most notably — U.S. Postal Service mail sorting by ZIP code. If mail sorting systems/machines with digit recognizer software installed were deployed, the potential savings could be more than $1 million a day, given that USPS processes more than 21 million pieces of mail each hour, based on 10,000 sorters working at a $15 per hour rate. SQL (Structured Query Language) has been the Lingua Franca for data query needs since the 1980s. It is an expressive, declarative query language well-suited to analytics tasks, backed by databases, and still widely used today. It is often the chosen interface provided/supported by software applications. However, petabyte-scale NoSQL datastores (notably those built on the Hadoop ecosystem) use other programming paradigms (e.g. MapReduce) to execute queries. While they are easy to scale, these queries are challenging to develop and comprehend. What if you could use a standard SQL-compliant language to write queries but tap the scalability and capacity of Hadoop? 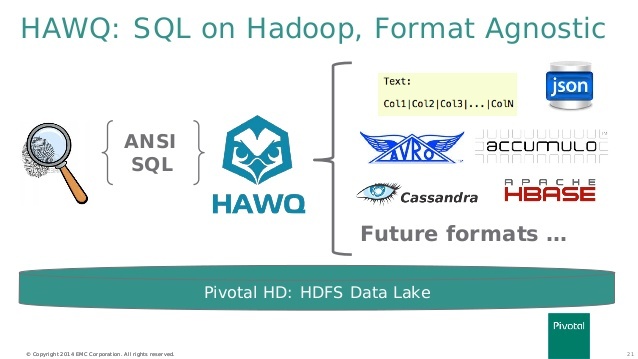 Pivotal HAWQ is a SQL engine that sits on top of Hadoop and HDFS, allowing complex SQL queries to run in massively parallel fashion. This puts it in stark contrast to traditional SQL warehouses, in which the backed storage consists of local file-systems tied to the query engine, and scaling efforts involve master-slave replication or sharding schemes—often resulting in solutions that are hard to maintain or evolve. HAWQ gives you the best of both worlds: SQL on the frontend and massive scale on the backend. It’s like the mullet of data query. 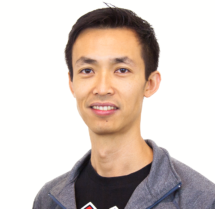 The MNIST dataset size is only about 100Mb: tiny by Hadoop standards. It’s easy to forget that HAWQ and other tools like HBase can scale to hundreds of gigabytes. HAWQ takes care of storing the data in distributive fashion quietly in the back, exposing a familiar SQL interface to the user. Identifying written characters is often approached as a machine learning problem, whereby a classifier is trained on a sample of data (e.g. my handwritten “8”) and used to classify new data (e.g. your handwritten “8”). MADlib is an analytics package that enables HAWQ users to perform many of the same statistical and machine learning techniques in SQL that are normally done in R or Python. Image classification is one common example. The MADlib approach stands in contrast to a “typical” model building workflow, in which data is exported and imported between the database and an external machine learning environment for model training. Create a “training_data” table and load training data into it. Create a “test_data” table into which we will import all test and training data. The labeled training data will help determine cluster-to-digit mapping once clustering is complete. We’ll add the training data because resulted clustering IDs are arbitrary. Run k-means clustering using a MADlib SQL query on the training table to determine cluster assignments. The cluster meaning will be determined by the cluster’s membership, e.g., all items in clusters with mostly “9” are assigned the label “9”. Assign unlabeled test data to the nearest centroid (from prior model training step) and adopt that cluster’s label. The instructions below are aided by the scripts located in my github repo. On the contest’s data page, there are two .csv files provided: Training data (a 74Mb .csv file) and Test data (a 49Mb .csv file). We now create the test_data table using script 7. In addition to having a unique test_id column to identify each digit, we will also have a “label” column in the table. This is so that the added training data can be used to create clusters to which the digits are mapped, as mentioned in the plan’s Step 4. The test dataset converted for PSQL loading. ‘|’ is again a delimiter here, where the first field is the label we are using for marking this row as test data (-1). Prepare some labeled data to be added into test data table. We add 20000 rows from training dataset for cluster labeling purposes after the fitting is done. Before we run MADLib’s k-means clustering query, here’s a quick overview of how it works. K-means clustering groups instances into k clusters (k is specified by the user) depending on their feature similarities. In this case, features are simply the pixel values of each 28×28 image, but they can also be calculated (e.g., the ratio of white to black pixels). The clustering algorithm proceeds iteratively: in each step, every item is assigned to its nearest (in Euclidean distance) cluster “mean” or centroid, and then a new cluster mean is calculated from those assigned points. The process terminates when the item assignments don’t change. This MADLib query retrieves centroids from the training_data table that starts with random centroid seeding (i.e., random centroid positions). We know there are 10 digits to identify, and set k=10 for the number of clusters to calculate. The query above will return centroids using one of Euclidean, element-wise, distance and average aggregate functions. At the top of the assignments are the test data and each of its assigned cluster. Note that the cluster_id isn’t the digit; the cluster_ids need to be mapped back to the corresponding digit by utilizing the labeled data that follows after the test data rows. We can see the fitting accuracy is high enough that if we look at the labeled data rows, we quickly see a majority cluster for each digit—for example: cluster 7 for digit 0, cluster 6 for digit 1, cluster 0 for digit 2, cluster 8 for digit 3, and so on. To prepare the submission file, we simply determine the majority cluster_id for each digit and replace each calculated centroid with its corresponding mapped digit. Each line refers to Nth row in the test dataset, and its corresponding digit. 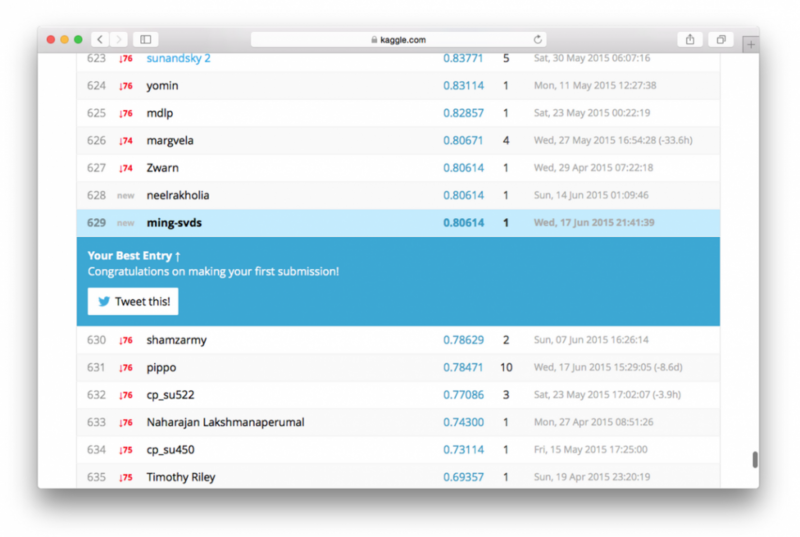 Upon submission to Kaggle, ranking in the competition is immediately determined. Looks like the clustering accuracy is about 80%, which isn’t great. But that is not bad at all for a dozen lines of SQL query to save the Postal Service some big bucks here! Hopefully this tutorial served as a helpful introduction. Keep in mind that this only a glimpse of what MADLib and HAWQ have to offer. Data analytic tasks are often iterative processes that require frequent tweaking of model parameters. In the case of k-means clustering here, we may wish to experiment with different initial groupings, distance functions, seeding ratios, and so on. Or we may wish to try a different clustering technique such as k-Nearest-Neighbors or Support Vector Machines—both of which have been shown to be great digit recognizing techniques and could be done with almost no data change, simply running the relevant queries. The takeaway here is that having a workflow that requires minimal or no data movement can free the team to focus on solving the problem at hand. And if your project requires running analysis on large amounts of data where SQL is already part of the workflow, then HAWQ and MADLib may just be the right tools for you. Experienced in security software systems and real-time cloud communication platforms, Ming is excited to help clients explore the data frontier by experimenting with rapid prototyping and tools.